Valentine’s Day is all about showing that special someone in your life how much you care, but it’s not just our human companions who deserve to be shown some love. Snuggling up with your beloved moggy will make for a truly pawsome Valentine’s Day and best of all, they won’t judge if you want to spend the evening in your PJs! Your moggy will be pretty easy to please when it comes to dinnertime, so you don’t need to go to the effort of preparing a three-course meal. 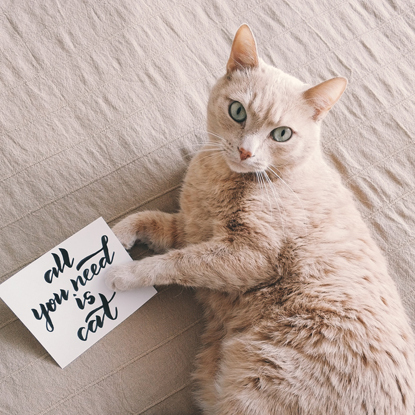 All you’ll need is a bowl of their favourite complete cat food and a separate bowl of fresh water (make sure there’s some distance between the two bowls as your cat will prefer to drink away from their favourite eating spot). For an added treat, you could even heat up their meal to room temperature to really enhance the food’s enticing aroma. Then, unless you find a bowl of meaty chunks particularly mouth-watering, you can spoil yourself with whatever you fancy – time to dig out the takeaway menus! Cats are pretty cheap dates, so instead of getting them flowers and a box of chocolates (chocolate is toxic for cats and many types of flower are poisonous to them too! 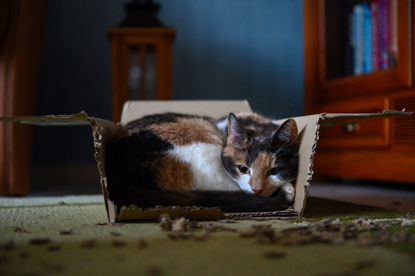 ), they’ll be more than happy with a good, old cardboard box to sit in. Alternatively, you could treat them to a new toy to play with, or get creative and make one yourself. After all, homemade presents are the best presents. The best way to strengthen your bond with your kitty pal is to get them stalking, chasing and pouncing with their favourite toy. 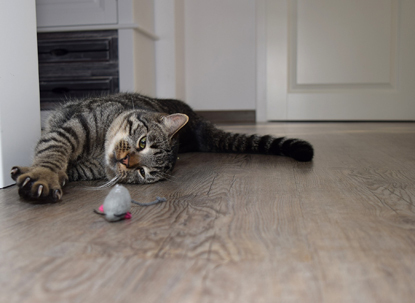 Playtime causes the release of happy hormones in your cat’s brain, so they’ll be grateful for the chance to burn off some energy after their tasty meal. The best toys are balls they can bat around, or fishing rod toys that they can chase as you drag them along the floor. Just make sure you keep your fingers and toes out of the way! Curling up on the sofa for a cat nap is a great way to end the evening. 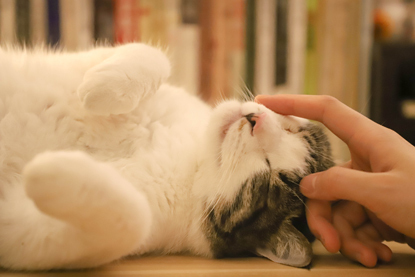 Find a nice soft blanket that your moggy can knead with their paws and give them a gentle chin rub or stroke behind the ears to get them purring. You could even have a moggy pampering session and brush their fur to keep it looking soft and shiny. Wondering if your moggy date loves you back? Look out for the signs in our video to find out! Who is your kitty Valentine? Let us know in the comments below or on Facebook or Twitter.